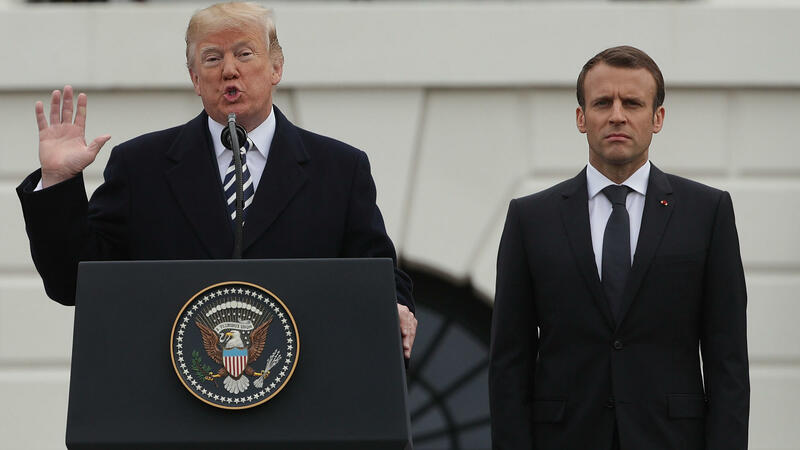 President Trump and French President Emmanuel Macron participate in a state arrival ceremony at the South Lawn of the White House on April 24. President Trump speaks alongside Canadian Prime Minister Justin Trudeau during a meeting in the Oval Office at the White House in October. Ahead of Trump's arrival, French President Emmanuel Macron tweeted suggesting the international Group of Seven could issue a communique at the end of the summit that leaves out the United States. "The American President may not mind being isolated, but neither do we mind signing a 6 country agreement if need be," Macron wrote. 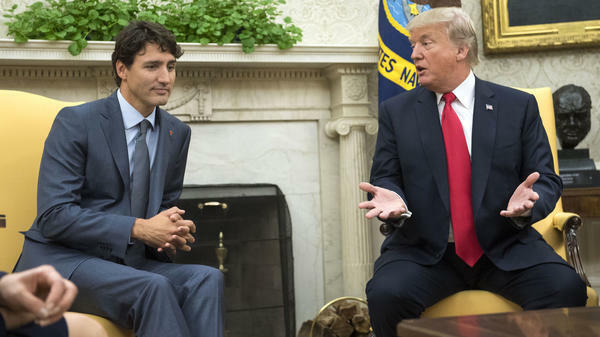 Not to be outdone, Trump responded on Twitter saying that both Macron and Canadian Prime Minister Justin Trudeau "are charging the U.S. massive tariffs and create non-monetary barriers." In a second tweet Thursday evening, Trump said Trudeau "is being so indignant, bringing up the relationship that the U.S. and Canada had over the many years and all sorts of other things..."
Tensions between the U.S. and its allies have increased in recent weeks after a series of White House decisions have frustrated some of the United States' closest international partners. "America stands very much alone as they enter this G-7," Heather Conley, director of the Europe program for the Center for Strategic and International Studies, told reporters on a press call. "I regard this as much like a family quarrel. I'm always the optimist. I believe it can be worked out," top White House economic adviser Larry Kudlow told reporters on Wednesday. In the past, the U.S. has had low points with Europe. In the lead-up to the Iraq War in 2003, the U.S. was at odds with France and Germany, as the two European countries worked in opposition to the war. At the time there was even a symbolic call by critics to change french fries to "freedom fries" in the United States. "There's never really been a fundamental question about commitment to the postwar international economic order," Thomas Wright, a senior fellow at the Brookings Institution, told reporters on a call about the summit. "That's really what's in question today." At the start of Trump's presidency, many foreign leaders worked to develop cordial relationships with him, hoping that it would help to make Trump more willing to compromise on some of his more contentious campaign promises. "There is a feeling, I think, over the last few months that that approach has not borne fruit, and that they haven't really gotten anything for that friendly approach," Wright said. The U.S. and the rest of the G-7 countries — Britain, Canada, France, Germany, Italy and Japan — depend on each other for security and as economic partners, so the governments will have incentives to find some common ground. "One risk is that others will take advantage of this apparent vacuum in American leadership and the lack of trans-Atlantic consensus and act in ways that will harm trans-Atlantic interests, whether it's Russia in the Eurasia ... or China in Asia," said Ian Lesser, of the German Marshall Fund.